I'd much rather go barefoot than ever wear shoes. I refuse to wear shoes unless it’s absolutely necessary. I never wear them in the house. When my kids were small & they’d see me wearing shoes, they’d ask where I was going. I used to give small dinner fancy parties with crystal, china, sterling & bare feet. I have broken several toes by bumping them into chairs. A very good friend of Nameless was a talented cartoonist. When they were in high school he drew cartoons all over a pair of her white tennis shoes. Then, on the toes, he named the shoes. The right one was "Alfred Lord Tennis-shoe" & the left was "Grou-shoe Marx". To see more weird (& even weirder) shoes, click HERE. If you've had enough & just want to see some cartoons, just scroll down. 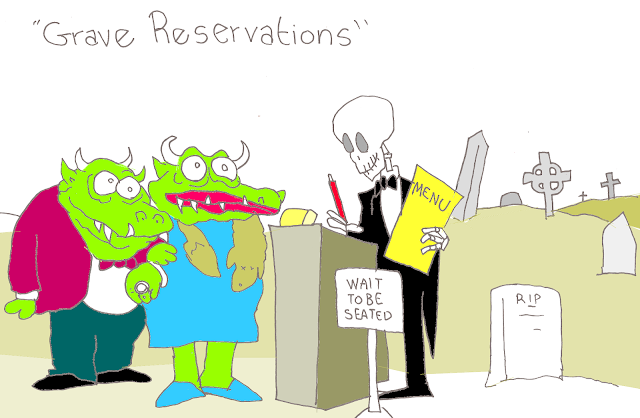 Do you have grave reservations about Halloween? Click (LINK) then scroll way down to Pet Halloween Costumes. stop that, Bud! People are watching! When one of our granddaughters, Nameless III, was just under 2 years old, her mother & father brought her & her older sister to our beach condo. While Bud, Nameless, Nameless II & I went for a swim she laid down on one of our twin beds for a nap. Her daddy laid down on the other bed. He woke up about a half hour later in a panic--Nameless III was gone! He thought she might have fallen down the stairs or was wandering around alone outside. Imagine his relief when he found her sitting peacefully at our breakfast table, happily devouring strawberries from a just-purchased flat that we had left on the table. By the time he had found her, of course, she & the table & the chair she was sitting on were all bright red!! Her older sister, Nameless II, was born near the beginning of July, so she was almost 1 1/2 years old when she came to our house one Christmas. There were a bazillion or two gifts under the tree. (My family used to claim that if I gave someone a deck of cards I would wrap each one individually. Probably a slight exaggeration.) Anyway, she took one look at the tree & the gifts & her eyes grew huge. She drew in a deep breath & said in a baby voice, "So MANY pwesents--ALL fo' me!!" Matt was out here from Connecticut, staying with his brother Blake, when the 9/11 terrorist attack occurred. He had been scheduled to fly home that day. As you'll remember, all planes were grounded after that for a week or so. Matt's 6 year old daughter, Lisa, missed her daddy very much. Her mom tried to explain to her why he couldn't get a plane home for a while. Lisa asked her mother, "Why can't he just walk?" When Lisa's brother, Brian, was between 1-1/2 & 3 he used to strip naked & run into the room where she was with her friends. He just wanted hugs & kisses. He's now 16 & his girlfriend won't let him do that anymore. 1. She talked very early, but not always too clearly. One thing she loved & requested often for lunch was chicken noodle soup, only she called it "Hickey noo noo hoop". 2. You can see Century City from our front window. When she was about 2, she was looking out the window one evening waiting for her daddy to come home. The hotel must have just installed those yellow bug lights on their balconies because she called me & said, in an awe-filled voice, "Mommy, the hotel turned to gold!" 3. When she was in the 2nd or 3rd grade, Bud & I took a vacation & my folks moved into our house to care for our kids. She was walking home from from school (it was normal for kids to do that then) & was very late. My folks were worried. When she finally got home, my dad asked her why she was so late. She was logical even at that age; she said, "I took a long cut!" 1. He hated to take showers when he was young. He would often turn on the shower & sit in the bathroom for a while & then come out bone dry & just as dirty as when he went in. Once, I made sure he actually got in the shower, which must have made him angry, because when he was through & I went into the bathroom to straighten up I found he had written the “F” word on the steamed up mirror. He tried to, anyway. He had put an “e” on the end. FUCKE. It looked like Shakespeare was swearing. My problem, as a loving & helpful mother, was to decide which was more important—telling him not to use that kind of language or correcting his spelling? 2. A friend of ours had an operation to have part of his colon removed. We were discussing this at the dinner table & Matt asked us, "If he had part of his colon removed, does that mean that now he only has a semicolon?" 1. I was exhausted from having 3 children under the age of 6 to care for, so my sweet husband hired an au pair. (Thank you. Bud!) On her first night, she cleared the dinner dishes & brought in small bowls filled with water & a couple of slices of lemon. Never having seen finger bowls before, Blake (our youngest) started crying. I asked him what the matter was & he whined, "I don't want soup!" 2. We got emergency calls twice from his elementary school. Once he fell UP the stairs & the other time he tried to hit another kid in the stomach, missed & got him in the belt buckle. He broke his knuckle! 3. My husband may have shown me too much affection in front of the kids. Blake was very young & he was standing next to me at the kitchen sink while I was making dinner. He pointed to my leg & asked, "Is dat yours?" I told him yes. He then pointed to my arm & asked, "Is dat yours?" Again, yes. Next, he pointed to my breast & asked, "Is dat Daddy's?" When Bud & I were dating, his father, Phil, was the West Coast Studio Representative for the Musicians' Union. As such, he had a pass to the Hollywood Palladium, a VERY fancy dance pavilion. (See what Wikipedia has to say about it HERE.) We used to go really often on his pass to dance to the big bands. So often, in fact, that when Phil once tried to use his own pass to get in he was told that his signature didn't match! but copy, paste & listen to it--it's great!! It should be the first one on the page. Youtube/AT SUNDOWN by Manny Klein 1946 JAZZ! !